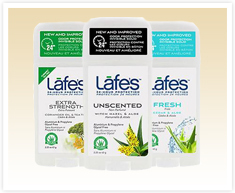 Today, Lafe’s is the only company that produces all natural, organic deodorants that are clinically proven effective for 24 hours! These products are free of Propylene Glycol, Aluminum, Parabens, Sodium Laurel Sulfate, Petroleum products and artificial colors. 100% of all scents are provided through essential oils. Lafe’s strives to create organic products that are free of toxins and harmful chemicals, because they know that what goes on your body, goes in your body. The mission of Lafe’s is to create a genuine and authentic natural personal care brand that promotes sustainable living and supports a strong commitment to environmental stewardship by creating products consumers trust and are affordable to all. Lafe’s believes in using business as a force for good. Lafe’s donates a portion of annual profits to causes that work to eliminate the environmental causes of breast cancer.